Pottery, relief, 0.25L or 0.125L, pewter lid. 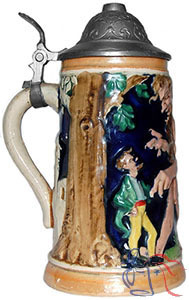 The central image on this child’s stein is taken from a German fairytale (“Das Tapfere Schneiderlein”), collected by Jacob and Wilhelm Grimm, and first published in 1812. The story chronicles the adventures of a tailor who faces and survives several challenges from giants and, as might be anticipated, ultimately marries the king’s daughter and lives happily ever after.